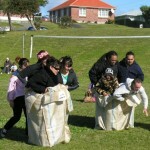 Te Ora Hou is based in Wanganui – we are a Maori, faith-based team, with six centres across Aotearoa, New Zealand. The foundation of our work is an initiative called Tiakina ō Tātou Tamariki ( run in Gonville West, Castlecliff South in Whanganui and and Kaiti/Titirangi in Gisborne) and it’s all about leading change for ourselves. 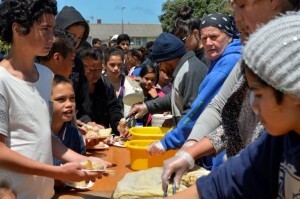 This story concentrates on Stone Soup in Whanganui but it includes what we are learning from both neighbourhoods. Our neighbourhood was not functioning well in 2007. We had a low trust in services and a low trust in each other. We then experienced a trauma and the impact raged across the community. In that moment we were activated to think and to act differently. We began to share ideas, and that is how Stone Soup began. Stone Soup is a folk story from Eastern Europe – the philosophical point of the story, which is key to our place, is the belief that each person in our community has something of value to offer. Stone Soup is a mix of things based around a vision for a peaceful, connected, caring community. It’s a community room based at a local school. It is a bunch of great ideas that we try; such as a craft group, a walking group, Stone Soup radio station, Growing Gardeners and community dinners. It’s a gathering we hold every two months at the local park, led by residents and others passionate about our collective capacity. It’s a table at the gathering to sit around and talk about what’s hot, what’s not and what we want to do about it. These are courageous conversations, sometimes making ourselves vulnerable to each other. We talk about child safety, speeding cars, bullying. We celebrate success from sobriety to the birth of a child. Establishing a boys intermediate age youth group in response to concerns about unhealthy behaviours. Supporting three residents onto a school board to address community concerns. Supporting a woman to become a licensed Zumba teacher in return for one low cost Zumba class a week. We’ve also developed an intentional conversation about family violence, the dynamics, and the various support residents can provide. The importance of this is illustrated in the journey of one of our neighbourhood mothers. Her family has a long history with services, and up until recently her children were under CYF care. She came to one of our park gatherings and after encouragement from us told her story, mentioning eventually that she was an alcoholic who had been sober for nine months, so things were going well for her. She told everyone if she could do others could also. This mother is now qualified in elder care, she got her first job, at 37 years. Her children are back her care, she is still alcohol free and she has found her voice. The impact of harmful, criminal gang behaviour had been one of the community’s biggest concerns, lives were being lost. After a number of korero our approach settled on inviting everyone to be part of the Stone Soup journey. The behaviour of one group was particularly challenging but over time their senior leadership articulated an aspiration for a better quality of life for their whanau. We are quietly encouraging that group, offering support to individuals at levels they can accept It’s a long term journey. Gang behaviour was not a top concern in our 2016 neighbourhood survey. This doesn’t mean all harmful behaviours have changed but we see change happening. It’s tempting to sugar-coat our story, to make our stuff look better than it is. To roll out the successful achievements in a blaze of glory, to hide the unimpressive stuff, to simply deny the existence of the failures. We were mindful of this trap and turned to Inspiring Communities to help us carry out a survey to measure change. The results were not that flash – the change we thought we’d seen wasn’t strongly backed up by data. We were gutted. We asked I C’s Denise Bijoux to ask us the interrupting, critical and hard questions to trigger ideas – think with fresh eyes. Having someone outside our community ask those hard questions has been valuable. We’ve had funders join us along the way. A genuine high trust relationship, multi-year funding or cross-funder arrangements, feeling safe to tell the stories of failure and accountability reporting that captures stories of change are what we value the most. Substantive relationships with supportive funders who are open to new approaches, has enabled us to shift our focus from filling funding gaps to focus on the vision of change we have – this is a Community Strategic Plan.